Fifa president Sepp Blatter is preparing to perform an extraordinary U-turn by calling for the release of court documents which could reveal that senior officials at the world governing body took bribes. Fifa has repeatedly blocked attempts by journalists to have the documents released. The BBC has learned that Blatter is to push for the publication of the papers at a crucial two-day meeting of the committee in Zurich, which starts on Thursday. The documents relate to a criminal investigation into the collapse of Fifa's former marketing partner International Sport and Leisure (ISL) and are believed to show that senior Fifa officials were paid kickbacks in return for granting ISL lucrative World Cup television and sponsorship rights during the 1990s. Last year, lawyers acting for Fifa and the officials paid 5.5m Swiss francs (£3.9m) to settle the case and keep their identities secret. A new-look executive committee including representatives from wider parts of the game such as leading clubs and leagues. Members would be proposed by the five confederations but would have to be voted on by the 208 member associations. A fit and proper persons test for all executive committee members which would require disclosure of any previous criminal investigations or convictions and any conflicts of interest. A reformed ethics committee to be made entirely independent of Fifa and composed of three new parts - a prosecutor, an investigations unit and a court to deliver final judgements. A solutions committee made up of senior figures from outside the game who will examine key issues facing the sport. A change to the way World Cup hosts are chosen, with the congress and not the executive committee taking the final decision. But last November a BBC Panorama investigation claimed that the two officials were former Fifa president Joao Havelange and his son-in-law Ricardo Teixeira, a Fifa executive committee member and chairman of the World Cup organising committee for Brazil 2014. The programme said Teixeira received £6m in bribes via a front company called Sanud which was registered in the tax haven of Liechtenstein. The Brazilian Fraud Squad has now opened an investigation into the allegations. Reports say it wants to make a request to the Swiss courts to have the documents released as part of its inquiries. In May this year Fifa appealed for the second time against a Swiss prosecutors' decision to make them available to the public. The case is due to be heard later this month by the high court in the Swiss canton of Zug. But with Fifa under huge pressure to reform following months of damaging corruption allegations levelled at senior executives, Blatter has now agreed that the documents should be released and, if approved by the executive committee, will make a request to the court. Sources told the BBC that the proposal would form a package of changes to be tabled at this week's executive committee meeting. Having promised "zero tolerance" following his landslide re-election as president on 1 June, Blatter has been convinced that he needs to demonstrate a deep commitment to clean up Fifa. 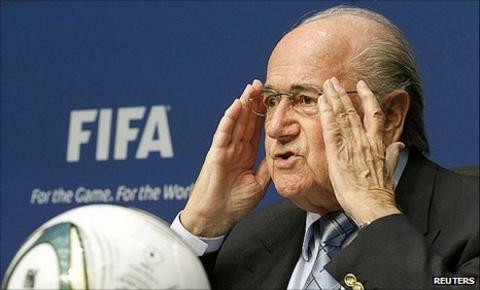 Calling for the release of the Fifa documents will be the most eye-catching of all the proposals. But it is a high-risk strategy. Teixeira is the frontman of the 2014 World Cup and is due to play a high-profile role in the announcement of the venues and match schedule for 2014 and the 2013 Confederations Cup on Thursday evening. The announcement is due to be carried live on Brazilian television. Teixeira is also said to covet ambitions to succeed Blatter as Fifa president when he stands down in 2015. The release of the documents could also leave other Fifa executive committee members under pressure. Last year's Panorama claimed that a confidential ISL document listed 175 payments to individuals and companies worth a total of £64m. Panorama said the list showed Nicolas Leoz, of Paraguay, received just under £500,000 from ISL. The investigation also claimed that Issa Hayatou, the head of African football, received just under £13,000. Hayatou, Leoz and Teixeira have denied the claims. As part of his promise to clean up Fifa, Blatter and general secretary Jerome Valcke have been working closely with anti-corruption campaigners Transparency International. They produced a damning report on Fifa in August which called for Blatter to introduce greater transparency and to make sweeping reforms to the governing body. Many of the reforms will need the support of a majority of the 23 members of the executive committee and that is far from certain. If Blatter meets strong opposition he may have to wait until next May's congress in Budapest to try and force the changes through. For the latest updates and reaction to this story read Sportsday Live. Have your say on Twitter via the hashtag #bbcsportsday.